Synthetic peptide corresponding to Human Synapsin I. Corresponds to residues surrounding amino acid 12 of Synapsin I. Our Abpromise guarantee covers the use of ab18814 in the following tested applications. WB Use a concentration of 1 µg/ml. Detects a band of approximately 77 kDa (predicted molecular weight: 74 kDa). Defects in SYN1 are a cause of epilepsy X-linked with variable learning disabilities and behavior disorders [MIM:300491]. XELBD is characterized by variable combinations of epilepsy, learning difficulties, macrocephaly, and aggressive behavior. Belongs to the synapsin family. Substrate of at least four different protein kinases. It is probable that phosphorylation plays a role in the regulation of synapsin-1 in the nerve terminal. Phosphorylated upon DNA damage, probably by ATM or ATR. Cell junction > synapse. Golgi apparatus. Controls - Anti-Synapsin I (phospho S9) antibody [EP2162Y] (ab76260) and Anti-GAPDH antibody [EPR16891] (ab181602). Observed band size: 77 kDa why is the actual band size different from the predicted? 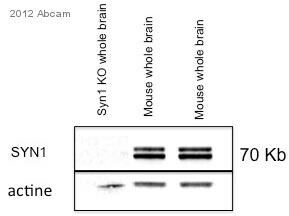 Anti-Synapsin I antibody (ab18814) at 1 µg/ml + Mouse brain tissue lysate. Observed band size: ~77 kDa why is the actual band size different from the predicted? Publishing research using ab18814? Please let us know so that we can cite the reference in this datasheet. Recently, I've been doing some experiments with some colleagues on synapsin 1. I have purchased 2 antibodies from abcam: one N-ter (ab18814) for WB and one (ab8) for IF. The ab18814 is working great! 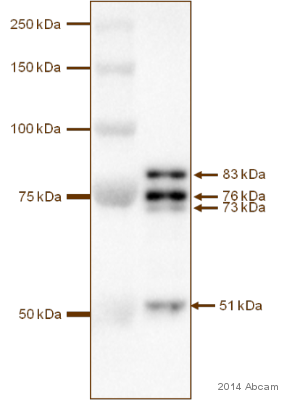 Do you think you could tell me the amino acids recognized by this antibody? my colleagues have performed MALDI technique and they need to make sure that the peptide captured by proteomic is the same than the one seen in WB. For IF, unfortunately, the ab8 gave poor results on mouse fixed brain sections, with small numbers of neurons stained (ab18814 didn't work on IF neither). Do you have any recommendations for another ab to test? Maybe ab64581? Regarding ab8, I'm very sorry to hear that it isn't working for you! This should be working in IHC on mouse tissues, so I'm not sure why it is giving you trouble. I took a look through our catalog, and it looks like ab64581 would be a good replacement. Ab64581 has been tested in IHC and reacts with mouse, and has very positive reviews. I've included a link to the datasheet below so you can take a look and make sure this is the one you want. I'm happy to send you a vial free of charge. For ab18814, this product is produced by a third party so we do not have the exact immunogen sequence. We do know that the immunogen peptide is taken from around amino acid 12. In my experience, immunogen peptides are normallysomewhere around 15-20 amino acids long, but obviously this could be different for this antibody. I'm going to see how much information I can get from the originator of the antibody, but I am not sure whether they will release the exact sequence to us. Please let me know if you'd like a vial of ab64581 and I will set the order up for you.